► FORMAT: Thesis, dissertation, and Capstone/project submissions must be PDFs. Do you have research datasets associated with your work? Those should also be deposited -- see Research Datasets for details. ► ACCESSIBILITY: Is your document accessible? Take a look at our Accessibility Submission Guide. While making accessibility changes is not required, it is considered best practice to avoid common accessibility mistakes. Go to the ScholarsArchive@OSU homepage. Click Login in the upper right corner. You are now on your Dashboard. Select Works in the column on the left. Click the Add new work button on the right side. Choose Graduate Thesis or Dissertation or Graduate Project (for non-thesis or Capstone, such as MPP, Marine Resource Management, etc.). Key fields are required and marked in blue on the edit page. If you aren’t sure about a field, contact us. Title - Title of your work. Creator - Your name, in the form: Last name, First name Middle initial. Abstract - Use the abstract from your work. License - The default license on the theses and dissertations template is All Rights Reserved; if you choose another, change the license on your document before uploading. See CreativeCommons.org and Copyright and Licensing for license information. Resource Type - Choose Dissertation, Master’s Thesis, or Capstone Project. Dates - Select Date Issued. Enter the date you presented your work. Degree Level - Choose Master’s or Doctoral. Degree Name - Choose the name of the degree for which you are a candidate. If you do not see your degree name in the list, select Other and enter the name. Degree Field - Name of the field(s) for which you are a candidate (e.g. Soil Science). If you do not see your degree field listed, select Other and enter the name of the degree. Commencement Year - Enter your commencement year as printed on your thesis, dissertation, or project. Advisor - Enter one name per line. Do not enter any titles. Use the form: Last name, First name Middle initial. Committee Member - Enter one per line. Do not enter any titles. Do not list your Advisor here. Use the form: Last name, First name Middle initial. Academic Affiliation - The academic department with which you are affiliated -- usually listed on the signature line above Dean of the Graduate School on your thesis or dissertation's signature page, (unless you are in an interdisciplinary program). Non-Academic Affiliation - Do not enter Graduate School. If your graduate work was associated with other programs, please add them here (e.g. Center for Genome Research and Biocomputing, Natural Resources Program, etc.). If you do not see your program listed, select Other and enter the name. Subject - Optional but encouraged. Choose a maximum of six. Rights Statement - In Copyright is the default setting. See Copyright and Licensing Help and Rights Statements.org for more information. Related Items - If there are other items in ScholarsArchive@OSU, a relevant website (e.g. your research group's website), or other resources that will help users understand your work, enter URLs for them here. Funding Statement - If your research was funded by a grant, scholarship, or other source, enter an acknowledgement here. Click Files at the top of the edit page. 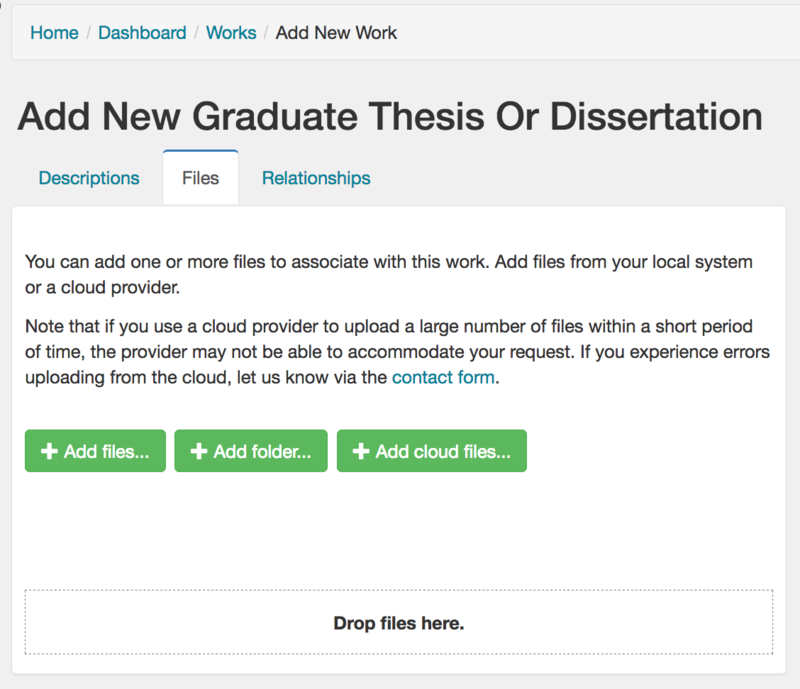 Select Add files and choose your thesis/dissertation/capstone file on your computer or drag and drop it into the box. Generally, files smaller than 2GB will upload through ScholarsArchive@OSU’s web interface. Please contact us for a consultation if you have larger files. On the right, select Public (recommended), Oregon State University only, or Private. Contact us if you have questions about embargoes. Users may temporarily restrict access to content on ScholarsArchive@OSU due to ongoing research, pending publication, or other reasons. Details are available on the Embargoes and Access Controls page. Under Visibility on the right side of the editing page, select the Embargo button. Select the visibility of your item during the embargo. Select the end date of the embargo. We offer a list of normal embargo lengths as well as the ability to choose your own date. Select the visibility of your item after the embargo. Select a reason for the embargo. NOTE: Depending on the content you are depositing, administrators may review your embargo request and contact you with feedback. Go back and review your metadata for errors and misspellings. NOTE: You cannot make changes after you submit your work into the review process -- if you want to change something, you must contact an administrator. Under Visibility, click Deposit Agreement to read it and then tick the box. Once your work has been submitted, it enters the review process. You will receive notifications (via email and in your ScholarsArchive account) regarding the status of your work, including whether you need to make changes before it can be accepted. After it is accepted, your work will be posted to ScholarsArchive. Need to make changes? See Document Review Process for more information. Research Datasets go through a different process. See Research Datasets for detailed information. If you are interested in depositing other content such as posters or presentations, select the appropriate work type from the available list after you select Share Your Work on the homepage. For example, posters and presentations fall under the Other Scholarly Content work type. Enter as much metadata as possible for your upload. When entering metadata, select the proper Resource Type from the list.